Labor unions are beginning to re-focus on continuous community organizing and agitation. This article was first published by Waging Nonviolence. Raise America is SEIU’s nationwide campaign to raise the standards for union janitors during contract negotiations. Credit: WNV/Shane Burley. All rights reserved. Workers packed into the crowded Logan International Airport in Boston on Wednesday, June 15, where the SEIU Union Local 32BJ brought together a large swathe of minimum-wage employees who often go unseen to hurried travelers. Baggage handlers, cabin cleaning staff and others who go through contracting companies were rallying together under an organizing banner with a history of struggle dating back 30 years. While the Fight for $15 raises headlines and wages across the United States, June 15 saw a national day of action in cities around the country for the annual anniversary of the Justice for Janitors campaign. For SEIU Local 32BJ, which handles 155,000 property service workers along the East Coast from New Hampshire to Florida, this was a chance to reclaim the history of a campaign that did the unthinkable in the early 1990s. “It has become a symbol for how labor unions and workers, working together and exercising their power, can establish standards in all sorts of industries,” said Eugenio Villasante, regional communications manager for SEIU Local 32BJ. The rally brought together traditionally employed janitors with other airport workers who have been fighting for years to organize a union in their own workplace. Just as with other low-wage positions that were thought to be beyond the scope of unionization, the Justice for Janitors campaign is a reminder of what is possible through strong public campaigns that organize the community as a show of solidarity. With SEIU’s Raise America campaign, which looks to raise the standards for union janitors across the country, the Justice for Janitors legacy holds critical lessons for how public campaigns win concessions. Although the earliest planning for the campaign can be traced back as far as 1986, Justice for Janitors came to life in Los Angeles in 1990. Grounds-care, cleaning and some maintenance workers were brought under the larger “janitorial” umbrella, as the average janitorial wage in Los Angeles had shrunk to an average of $4.50 per hour in 1986 through a combination of subcontracting and non-union competition. They went on strike in 1990, drawing on huge community and labor support, a staple SEIU tactic, and won a base raise of 22 percent over the next 36 months. This led to a wave of janitorial organizing, with SEIU winning massive victories over the coming years, culminating in the nationwide campaign of 100,000 janitorial staff in 2000. At the same time, student organizers with the University Students Against Sweatshops project used the Justice for Janitors banner for their own Campus Worker Solidarity campaign to support janitorial staff organizing against their replacement by non-union contractors. Despite this momentum, the janitors soon entered an incredibly challenging organizing terrain — specifically the 2005 organizing drive in Houston, where they took on the five biggest Texas custodial contracting companies inside of the anti-union political climate of the South. At this point, the janitors were making an average of $5.25 per hour, about a quarter of what the same positions made in New York City. After they fielded dozens of arrests, a large 5,300-worker unit of primarily Latino female staff won massive victories like health insurance and an almost $2.50 raise from the contractors. The legacy of the campaign has continued as a cultural signifier for the ongoing need to organize janitorial positions, which are often socially maligned and associated with Latino and undocumented work. In recent years, the campaign has drawn heavily on the Fight for $15, focusing on fast food workers in New York City. SEIU now represents more than 225,000 janitors in the United States—with California remaining a leader, given its more than 20,000 represented workers. SEIU Local 49 handles 1,800 janitors in Oregon and southwest Washington who use the annual Justice for Janitors Day to continue to raise the visibility of janitors as a dynamic part of the larger labor movement. SEIU’s Raise America campaign is helping keep the focus on janitorial staff, which has seen locals in 33 cities — representing 130,000 janitorial workers — fighting for contracts that reflect a living wage and adequate benefits. Raise America began two years ago, as a push to update many of the janitorial contracts that were soon expiring for SEIU locals. Since community support and solidarity between cities was expected to be key in pressuring major contracting companies to further reform pay and working conditions for janitors, the campaign has focused primarily on workers who are already unionized with SEIU and bargaining for significant increases in wages and safety standards. Organizers have also been using community action and public labor advocacy to further put pressure on massive contracting companies coming to the bargaining table. For janitors leading the fight in the Pacific Northwest, this annual event coincides with vigorous negotiations over key issues like safe workloads and bringing workers up to $15 per hour. The public rally brought together hundreds of workers from janitorial contractors around Oregon and Washington, as well as community supporters from a variety of other labor unions and community coalitions. The Portland State University Student Union has continued a long-term effort to support janitorial staff from SEIU, going as far as having an event the afternoon before Justice for Janitors Day, where janitors spoke at PSU about their experiences. Even with a union contract, and after almost 20 years with the same company, Wiberg only makes $13.20 per hour, with no mandatory sick days. After decades doing this work, Wiberg is concerned about having enough savings, should her body “wear out” from the aggressive repetitive work she does on her nightly shifts. “How can you save anything when you are living paycheck to paycheck?” she asked. After a bi-lingual event that raised the voices of Latino janitors in Portland, Oregon, workers took to the streets beneath a wave of flapping SEIU flags. For SEIU Local 49, this public show of support will help give workers an edge during their contract negotiations with some of the largest contracting firms in the nation, while—at the same time—signaling broader community support for the janitors. With workers pushing the $15 per hour line, they are tapping into a standard that “low-wage” workers have been setting across the country as different types of work, from fast food to part-time college faculty, put $15 per hour as the lowest wage acceptable. “The more members and visible community support, the better employers see that people stand with workers, with working families, and that they believe in dignity in the workplace,” said Mark Medina, a Portland-area janitor with SEIU Local 49, whose current contract battle with the five leading contracting companies in the area is building on the massive organizing project begun three decades prior. Nearby in Seattle, SEIU Local 6 pushed the Metropolitan King County Council to officially recognize June 15 as “Justice for Janitors Day,” putting into the record that the struggle for many of these “invisible” people is an ongoing battle to confront the exploitation of low-wage workers. The Raise America campaign and SEIU Local 32BJ, specifically, used this anniversary as a chance to highlight local organizing in the tradition of the original Los Angeles campaign. In New Jersey, workers came out to the Jersey City City Hall to show public support for local bills that would protect janitorial and maid workers by requiring 30-hour workweek minimums for employees and a 90-day notice if a building is canceling a cleaning contract. In Baltimore, 32BJ janitors testified before the Baltimore City Council for Councilwoman Mary Pat Clarke’s hearing on raising the minimum wage to $15 per hour. Clarke’s minimum wage proposal, which would raise the wage of 80,000 Baltimore-area minimum-wage workers by 2020, has been heavily supported by the union, while being opposed by business leaders at places like the Greater Baltimore Committee. Workers told their stories to a listening panel and highlighted the struggles of living at poverty wages. The Raise America campaign was built on the necessity of moving past the first victories of a union election and bringing vibrancy into the long-term struggles to raise a wage even when a bargaining agent is present. In each city where janitorial staff are represented, union organizers are looking at how to start addressing the key issues of low-wages and tough working conditions. For many, this has meant linking up with the broader Fight for $15 and going after legislation that would raise the base wages and bring in moderate reforms that affect workers. Further contracts will be expiring in Massachusetts and Rhode Island this September, so this is only going to build up steam as SEIU 32BJ continues the battle in the fall. At the same time, using the history of Justice for Janitors means drawing on a huge community-labor coalition of support for public actions that shift the balance of power toward the workers when negotiating union contracts. This presents a shift for many labor unions that are beginning to again focus on an active labor movement that sees the necessity of constant organizing and agitation, rather than just relying on negotiators after a union election is ratified. 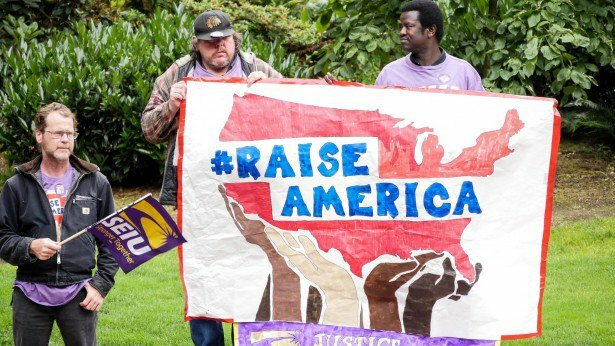 Raise America attempts to then bring the militancy and energy of Justice for Janitors into the ongoing battle for raising janitorial wages, an organizing campaign that wins through its permanence and the constant involvement of members. As many jobs shift, and SEIU begins to prioritize large campaigns at group homes and airports across the country, it means expanding the vision of Justice for Janitors by looking at low-wage, “invisible” positions as a united block with common interests. One of the largest questions for the future is whether this battle—represented both by Raise America and the broader Fight for $15—will be honing in on legislative victories across the country or continuing to focus on unionizing the growing low-wage sector. For janitors, this means looking to where the strongest victories have been and making that a model for how to keep “invisible” workers heard in their workplaces.